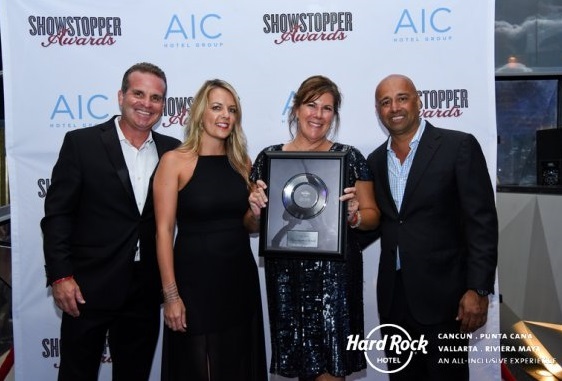 I recently attended the Hard Rock Showstopper Awards at the beautiful Hard Rock Riviera Maya and was thrilled to receive the coveted award of the #1 Hard Rock WOW Specialist (wedding agent) in the United States and the #2 Agent in sales in North America. So when planning your destination wedding, work with the leader in Hard Rock weddings to receive the best service and support for you and your guests, lowest rates, and most knowledge of the resort, staff contacts, and extra perks! Join me for a webinar on Hard Rock all-inclusive resorts and their fantastic wedding program on July 20, 2016 at 7:00 pm EST. Find out how you can have your dream wedding and save money too! Sign up below or contact me at Cherie@IslandVows.net for more information. When you sign up I will send you a link to the webinar and also send a reminder email prior to the event. All-inclusive resorts aren’t necessarily expensive when you add in everything that you receive for the prepaid rate. The question is how much value are you getting for your money. Take a hotel room for 2 people in a city where you may vacation in the U.S. , say Chicago, Atlanta, New York, Denver. Any of these would cost you minimum of $150 per night plus tax and probably much more. So take the $150 plus tax and you have roughly $175 per night. Now add on all of the food, room service, alcohol, beer, wine, bottled water or anything else that you would have in a day while on vacation. That could easily be $60 to $150 per person per day. So we will take the low end of $60 per person. Now add on a beach, lounge chairs, tropical weather, sunshine, music, activities, friends, family – can you picture it? Okay, that is worth something, correct? And don’t forget to add on a premium for the time of year. Getting out of winter is going to come at a higher price. So now we have the room at $175 per night, food at $120 minimum per day for two people, and ambiance which is pretty much priceless. The total for 2 people at the low end would be $295 per night. If you are spending roughly $150 to $200 per person on an average resort for all-inclusive that seems really fair. If you are at a luxury resort such as Hard Rock, Palace or an adults only resort, you really need to add to the budget. Hard Rock and Palace offer a very large resort credit that you can use for spa, golf, excursions, etc. and that really adds to the value. Instead of looking at an all-inclusive as expensive, look at the value you are receiving and compare to what you would spend in the U.S. on a similar vacation. Many of my destination wedding groups have never traveled to an all-inclusive but when they return they are ready to plan their next vacation! It’s easy, it’s relaxing, it’s a great value. Once you decide to have a destination wedding it’s time to find a TA (travel agent) to assist you. All TAs are not destination wedding specialists and many have never handled a group. So it’s very important to find someone that has your best interests in mind and has experience in destination weddings. A good DW specialist can assist you in finding the perfect resort and destination for your wedding. Some couples look for the cheapest rate, which TAs can provide as well, but by choosing the least expensive doesn’t mean that you will have a good experience or even save money. A destination wedding is not the time to try DIY (do it yourself). You need someone to assist you even though you may think you don’t! It’s not like shopping for a car or a new pair of shoes where price is the only thing that matters when you are getting an object for your money. When you look for a photographer, accountant, child care, attorney, decorator, or any other professional for advice and to take care of something important to you, do you want the cheapest even though they may have no experience or haven’t worked with the resorts? Many TAs work with the same suppliers and have the same or very similar rates, so if someone is giving you a much lower rate there may be a reason. Use the recommendations of other brides and ask for references. There are no fees or additional costs for my services and I would be happy to help you plan your wedding in Mexico or the Caribbean. Some of my favorite resorts are Hard Rock, Palace, and Secrets/Dreams/Now. They all offer excellent comps and benefits to couples and have amazing, customizable wedding packages. Have an amazing day! And remember Price is what you pay, value is what you receive. 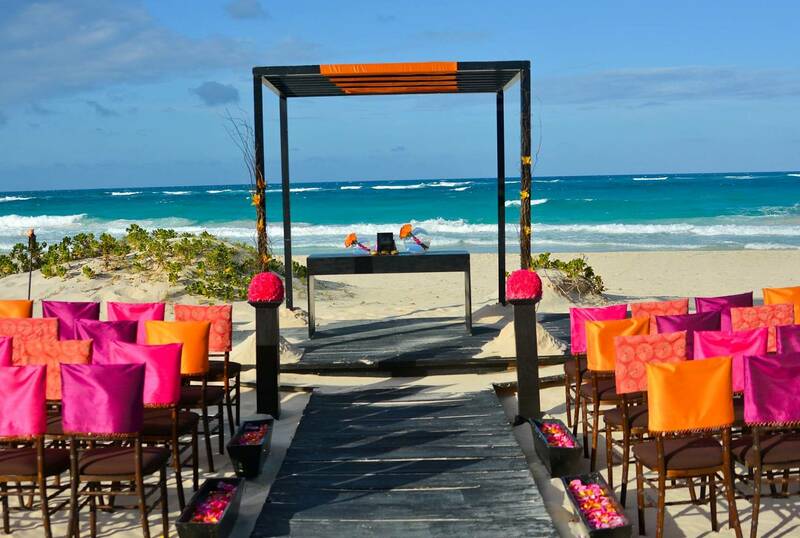 Resorts included are Secrets Maroma, Dreams Riviera Cancun, Dreams Tulum, and Now Sapphire. The wedding managers at these resorts have completed training courses and are certified South Asian Wedding Specialists and will ensure the utmost attention and care will be placed on the the cultures and traditions of these wedding parties. Below is a sample of included events. A dedicated on-site wedding coordinator will be on hand to help with the organization and direct the processional. The resort has many options available to the groom to make a grand and memorable entrance preceding the wedding ceremony. Overwhelmed with information and options on the internet?! Here are a few reasons you should consider using a travel agent for your vacation, honeymoon or destination wedding. 1. Personalized Service: An online travel site is a computer that does not have your best interests in mind. Travel Agents understand what you want and what you value in your travel experience. A good agent will get to know you and your travel wishes and customize a trip to your needs. Aside from the personal service you receive while in the planning stages of your trip, you will have customer service while you’re on your trip too. Your agent is there for you before, during, and after your trip to ensure that you have a good experience and will address any issues along the way. 2. Advice: An experienced agent has very likely traveled to the destination and has firsthand knowledge and photos of the resorts that they recommend. Experienced agents, unlike a web page, are experts in understanding complicated itineraries and travel to other countries. They also can provide a variety of options based on price, availability, and preferences. 3. Convenient One Point of Contact: Agents can handle every aspect of your trip from flights, resort stay, ground transportation, activities, tours, insurance and more. When guests have questions about the resort, destination, excursion options, travel questions – have them contact me so you don’t have to deal with it. Brides and grooms have enough to handle, leave the guests to the TA. 4. Time Savings: Instead of spending hours checking multiple websites, why not go straight to the source? A travel agent has all the information at their fingertips, saving you hours of searching. The internet is a great tool, but many times information provided on online booking sites is inaccurate and photos are edited. 5. Best Value for Your Money: Agents know where the values are. They have access to discounts and package rates that offer more for your money. They also know which resorts offer perks and comps for honeymoons or wedding groups. And there are no extra fees to you or your guests. 6. Less Stress: Planning a vacation, honeymoon, or destination wedding can be stressful. There are so many options and details to worry about. Agents do the work resulting in less stress for you. I provide booking updates of who has booked or inquired so you don’t have to keep track. You may want to book your own travel when you only need a flight or a hotel in the U.S. You should definitely use a travel agent for trips outside of the U.S., for group travel, a honeymoon, family vacation, or a destination wedding. 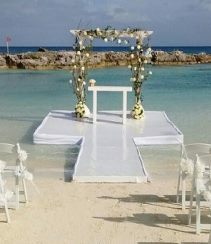 Contact Cherie@IslandVows.net to start planning your wedding in paradise! Just back from a wedding at Dreams Riviera Cancun. Wow is all I can say! My wedding group totaled over 185 guests of all ages from all over the US and Canada. Resort management went over and above to make everything perfect for my couple and their family and friends. Gina and Claudia were amazing in handling every detail of the wedding, reception, and other events. The wedding staff of Gaby, Claudia, Gina, and Lorena are truly amazing and will make your dreams come true! 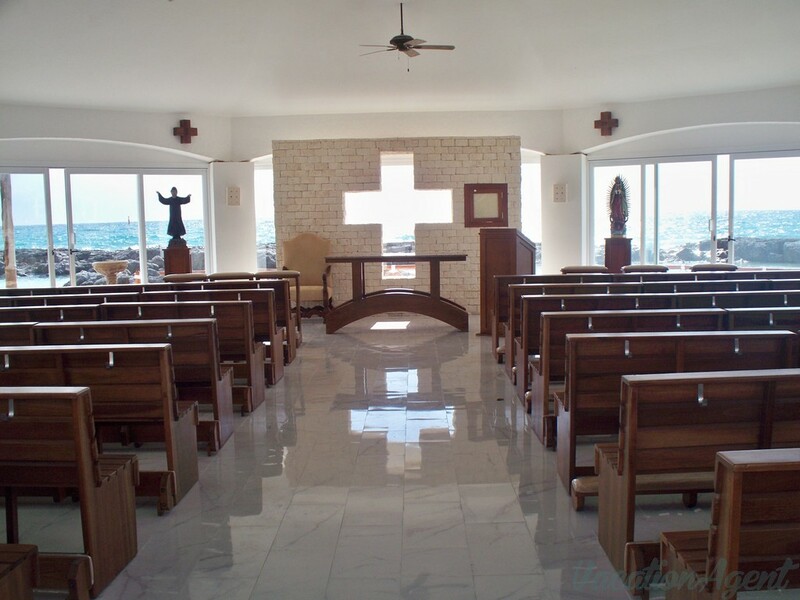 If you are looking for the perfect family resort for a wedding in the Riviera Maya, this may be it! The resort is still in like-new condition except the landscaping is now nicely grown up with beautiful gardens and palm trees. Rooms are large with an open concept, comfortable beds, nice amenities that include snacks, mini-liquor bottles, shampoo, body wash, lotion, toothpaste, etc. (Preferred Club room). Minibar was stocked daily along with cleaning of the room. The resort was at full-capacity during our stay and we never had to wait for a table for more than a few minutes. Food was delicious and the variety was good. Premium liquor is available for everyone – just ask for it! The Preferred Club lounge had computers available to use along with snacks, sandwiches, full bar with top-shelf liquor, and lounge area to watch TV. I feel the Preferred Club is worth the price of the upgrade. Pools were warm, poolside seating was limited if you didn’t get out early. Plenty of loungers on the beach were available though. Poolside bali beds are available as well (no fees or reservations). Wait service on the beach and around the pool was good. Beach has beautiful white sand, some sea grass does come on shore which is cleaned up regularly. DRC has something for everyone. Activities and games all day, Kid’s Club is open late so parents can have dinner with or without the kids, evening shows near the lobby were performed nightly, live music after the show. Fun ambiance in the lobby area in the evening, many people gather for drinks before or after dinner. Desires has music and dancing later in the night. Nine specialty restaurants with gourmet cuisine, six bars with premium beverages, gluten free and vegetarian menus, room service – no wristbands, no reservations required. Why do I love Dreams Riviera Cancun? Unlimited luxury with everything included that anyone could want along with royalty treatment – what more can you ask for?! For more information on Dreams Riviera Cancun, please contact me at Cherie@IslandVows.net . I am a Dreams Master Agent and specialize in destination weddings in Mexico and the Caribbean and would love to assist with your vacation or wedding plans! 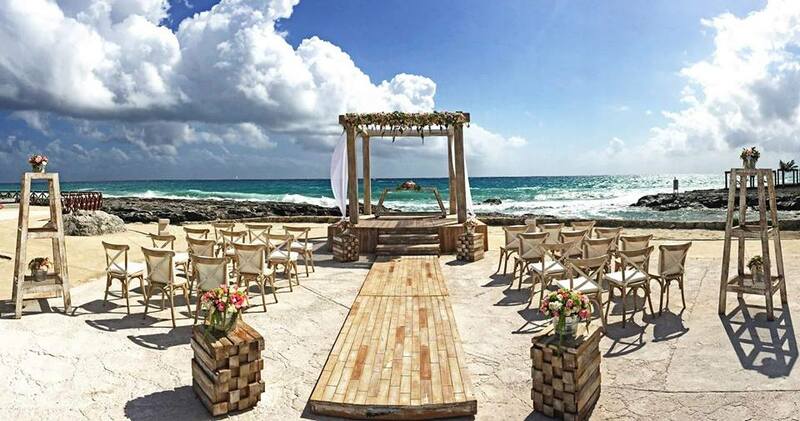 Also check out Dreams Riviera Cancun Brides on Facebook for info and conversation with other brides and grooms. It’s a fact, I love Punta Cana and the fabulous beaches there! This summer I took my family to Hard Rock Hotel Punta Cana and we had a fabulous time. The resort is huge, so be prepared to walk long distances or wait for the “train”. HRPC has something for everyone – great beach, pools everywhere, kids pool with waterslides, mini golf, rock climbing, golf, basketball, tennis, zorbing, live entertainment, Vegas style casino, Oro nightclub, shopping mall, 24-hour room service, premium liquor, excellent food in over a dozen restaurants all with no reservations, and more and more and more. Rooms are very spacious with a jacuzzi for two, minifridge with beer, juices, and soda, in-room liquor dispensers, plush beds, huge 2-head walkin shower, double vanities, bathrobes and slippers, and complimentary internet and phone calls to the U.S. Rock Star Level rooms and suites are also available with extra perks such as a butler, private beach and pool area, complimentary inroom snacks, aromatherapy, complimentary massage, and more. Pools for everyone – quiet pools, adult pool, activity pool, kids pool, VIP pool…many with swimup bars. and the beach…great for relaxing with waiter service. Plenty of big waves for body surfing or boogie boards, also a calmer area for people who don’t want the waves. And for those of you that are interested in a destination wedding…don’t look anywhere else. HRPC offers amazing group perks that include a complimentary stay, complimentary wedding or choose from very reasonably priced packages, complimentary functions, and more. 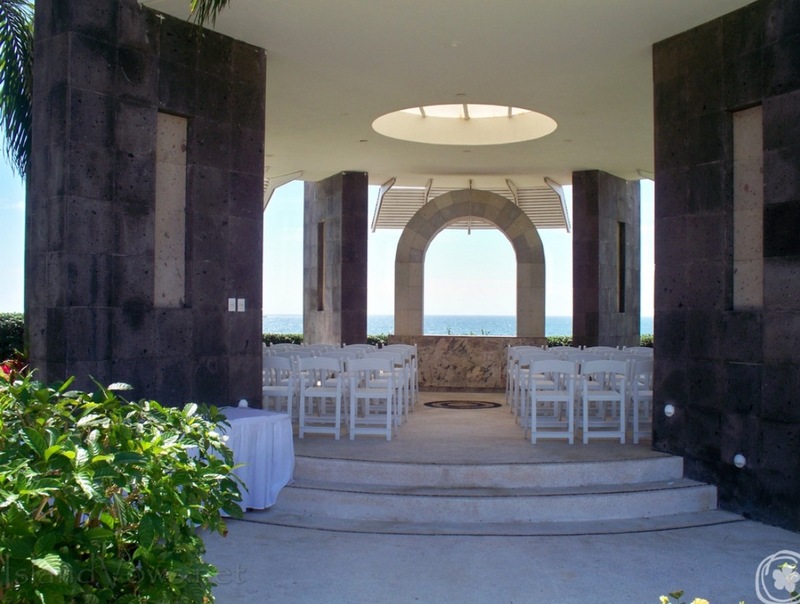 There are many gorgeous locations to choose from and reception and cocktail options are almost unlimited. Here is a link to the HARDROCK WEDDING GROUP COMPS.